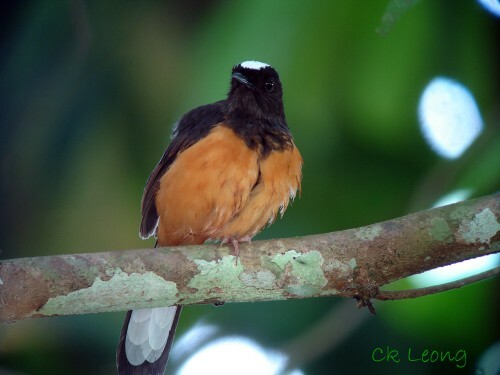 While the debate goes on whether Copsychus stricklandi should be lumped together with White-rumped Shama, visiting birders to Borneo should note that you can only see the “White-crowned” in the north, or otherwise known as the political entity of Sabah. For those who persist on seeing the White-rumped, you might find success in the pet shops around Kota Kinabalu, this because of lax enforcement of this protected species (a fine songster) and continued trapping in the south (Borneo). To untrained ears like mine, the songs of both species sound very similar but I have met pet shop keepers who insist that White-rumped Shamas from the wild have a wider “variety” in calls. Sorry I guess I have just added a little more fuel to the debate.